Welcome back to Chocolate Friday! Time to reward yourself with some chocolate after a hectic week! Oh, did I say Godiva? Did that get your attention? Well you know Godiva has fabulous chocolate! And they have a lovely new Spring collection including chocolate truffles, bunnies, biscuits and more just in time for Easter gifts or even Mother's Day! Look at this beautiful Spring Ballotin with the daffodil magnets on the box! And I love these new Spring gift boxes with spring truffles (Cheesecake, Spring Raspberry, and Strawberries & Creme)! 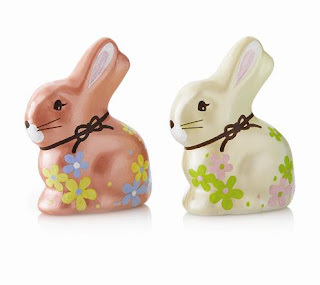 Can't have an Easter collection without some adorable chocolate bunnies! I had the opportunity to sample some Godiva chocolate! I got to try this cute carrot filled with candy-coated chocolates! Yummmm. Hubs and I had it and well, we enjoyed it so much we ate.it.all. in one sitting and never even saved one bite for our son (don't sorry about our son, he has plenty of candy)! Those chocolate pearls are delicious! The candy-coating has just the right amount of crunch and sweetness and the chocolate inside is high quality as you would expect from Godiva! And isn't that the most adorable packaging? One of you (U.S. only), my fabulous readers will win one of these Milk Chocolate Pearl Carrots for yourself! And because Godiva is generous and I worked with a sweet PR person (thank you Casie! ), the winner will also receive one of the charming chocolate flower lollipops pictured below! I know. I rock. Actually, Godiva rocks! How to enter: Stop by Godiva and then come back and leave a comment telling me what your favorite Spring item is! Super simple! This giveaway will be open through Wednesday 3/24 and the winner will be announced Thursday 3/25. 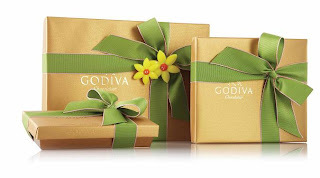 Disclosure: I received some free Godiva candy to sample and review if I chose and was generously provided with more candy to give away on my blog. Enough of chocolate from me! 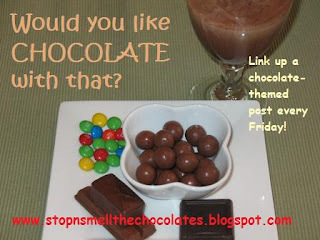 This is Chocolate Friday and I'm counting on you to link up some fabulous chocolate posts! 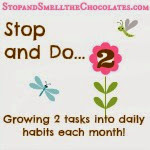 Please remember to only link to family-friendly posts that have something to do with chocolate and please try to include a link back here in your post so everybody can easily find more chocolate today! The new Spring truffles look awesome! Oh yum! I love me some Godiva! I'd have to go with the truffle box... hands down truffles are my favorite thing. No chocolate post for me this week. Today is my son's birthday so he got the top of the page! I do have chocolate in the house - he made brownies to take to the zoo with us for his birthday! You're killing me here! LOL! But just to show you how much will power I have, I'm going to enter but if I win, I'm not going to eat it until AFTER Easter! Ha! Big I choose the NEW 36 pc. Spring Ballotin because it just looks fabulous and has the most in a box size hugs to you! Oh yes, the Spring truffles look so awesome! I love variety like that - and they are always so pretty. What a great giveaway!!! thanks for hosting the giveaway...I hope I win!! Yummy! Bertie the Bunny is a classic that never goes out of style - he could hop into my Easter Basket any old time! The milk chocolate truffle gems seem divine! I could see me putting a crystal dish of these on my desk at work...and a parade of coworkers who suddenly prefer to see me in person rather than e-mail! Chocolate is chocolate, but you said to choose. And I'm going to go with the majority and choose the truffles. Creamy and chocolaty, what more could you want? 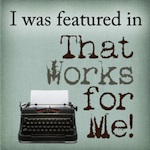 Today is the very first time I have seen your blog. I love it! 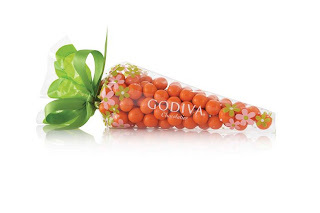 Everything at Godiva looks incredible, but I would have to choose the chocolate flowers. They are too cute! Thanks for sharing. GODIVA!! Those pearl chocolates look so good. So if I could get anything on their Spring menu it would be the 16 piece Spring Chocolate and Truffle Gift Box. Yumm!!!! The Easter Luxuries Basket looks amazing! So do the brownies. Yum. Love the spring truffles too. wow! I really like the sunflowers, but I like thew truffles also. I like the sunflower magnets! Just loving chocolate. like your recipes! This is such fun! I'm a chocoholic! And usually post at least one chocolate dessert every wk. I'll for sure be back! Oh, my choice would HAVE to be Bertie the Milk Chocolate Bunny, Hands down!!! I like Easter Bunny biscuits. Mmmm....I think the 16 pc. 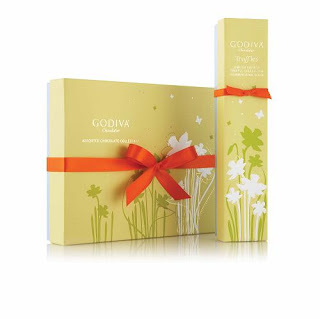 Spring Chocolate and Truffles Gift Box looks delicious. ALL of them look gorgeously inviting! But I decided on the spring truffle mix - just enough to get a good 'dose' of chocolate medicine. Oh yum! The yellow milk chocolate lolipop is so cute and I am sure it is delicious! I love the Yellow Milk Chocolate Flower Lollipop and it would be perfect in an Easter bakset. I think the spring milk chocolate truffle bag would be my favorite. What a fabulous giveaway!! The Spring Truffles look yummy and the 6 pc. Gift Box is adorable! I like any of the Easter gift baskets. 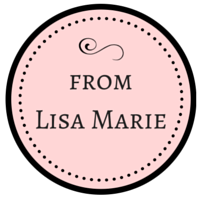 What a delightful work you do Lisa! Sampling Godiva chocolates! I know it's hard work but someone has to do it :) I would have to pick their luscious, melt in your mouth, delightfully tasty Truffles. They all look great but those truffle gems look especially good! The new spring truffles look fabulous! Cheesecake w/ milk chocolate, raspberry w/ milk chocolate, strawberries and cream ~ YUM! Love your site!! Thanks for the chance to win! omgg never try godiva!! but i know its really good chocolate !! bertie the bunny is cute, but I think I would have to choose the 36 piece spring ballotin! My computer wouldn't let me comment last week so..... Here I go... The candy coated ones sound like that other candy coated candy that has an M on it. YUMMY chocolate anything is goo for me. I just want those chocolate cupcakes!!! They look to die for!! I love the spring carrot candy in the festive green, and the choco gems! Truffles rock! !